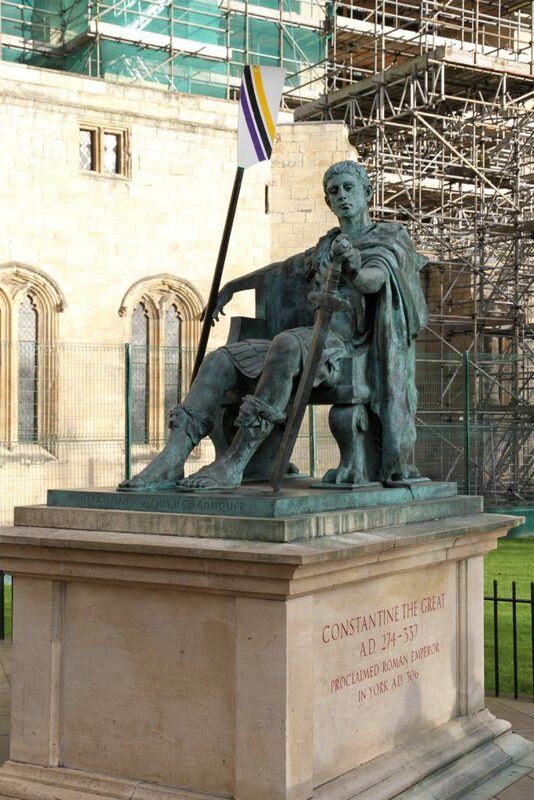 Archbishop of York Names ‘Constantine The Great’. 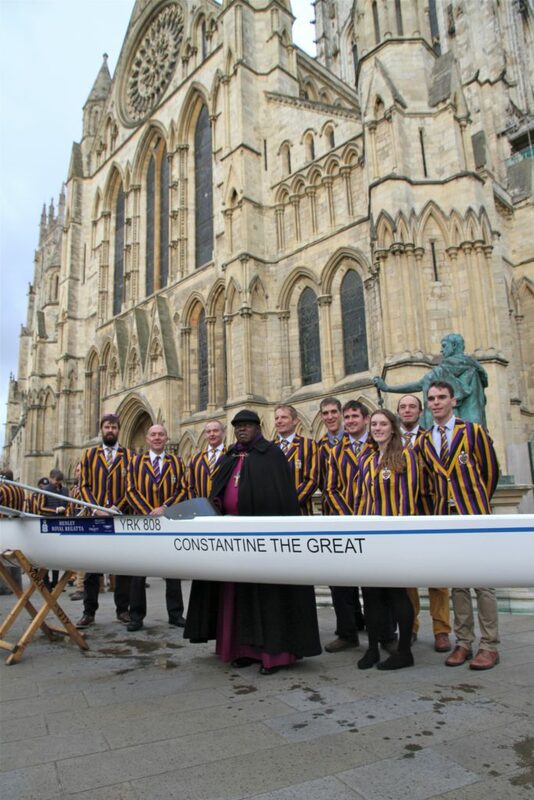 York City Rowing Club’s purple, black and gold blazers lit up the Minster and three cheers rang out last Saturday morning (18th) as The Most Reverend and Right Honourable Dr John Sentamu, Archbishop of York, named York City Rowing Club’s newest boat ‘Constantine the Great’ in front of the statue of the Emperor Constantine himself. Dan Lewis, YCRC Club Captain said, “The addition of this international-standard shell to our fleet ensures YCRC crews are in a great position to compete, and fly the Yorkshire flag, at high level national and international events”. Constantine rows bowside! Photo: D. Gray. The ‘Dad’s Army’ crew, who rowed Constantine to the second round of the Thames Challenge Cup at Henley this year were in attendance to greet the Archbishop, and regaled him with tales of their epic defeat of Thames ‘C’. After turning heads at the Minster, members returned to the club to an excellent second breakfast of bacon and sausage butties and pastries deftly prepared by the Men’s Squad. Thankyou to the Archbishop and his staff for a wonderful occasion, Paula Widdowson for putting us in touch in the first place, and to Carl Barker, Men’s Captain who worked so hard to bring the morning together – it will surely pass into YCRC legend! Photos of the day from the Dioscese of York can be found here and photos from YCRC’s Duncan Gray here. 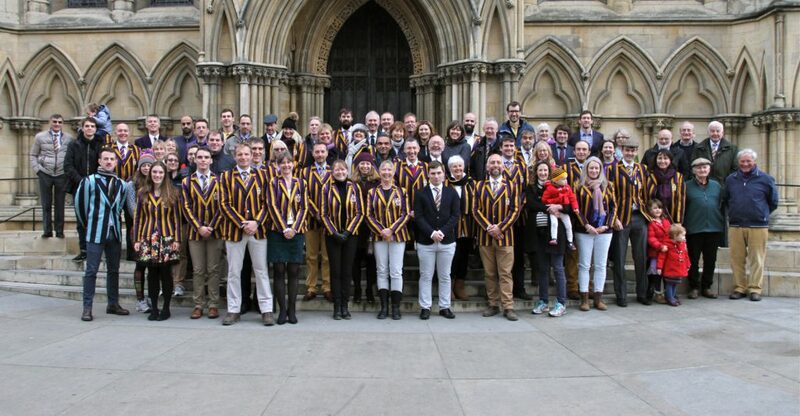 YCRC at the Minster, blazers and all! Photo: D. Gray.